Dia Of Conductor Strands: 14/0.3 mm. Maximum Conductor Resistance at 20 deg C: 18.10 Ohm. Thickness Of Insulation: 0.7 mm. 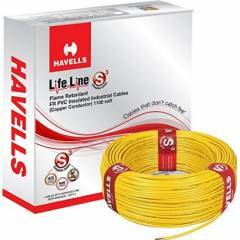 Havells 1 Sq mm Single Core Life Line Plus S3 Yellow HRFR PVC Flexible Cables WHFFDNYA11X0 Length 90 m is a premium quality Low Tension Cables from Havells. Moglix is a well-known ecommerce platform for qualitative range of Low Tension Cables. All Havells 1 Sq mm Single Core Life Line Plus S3 Yellow HRFR PVC Flexible Cables WHFFDNYA11X0 Length 90 m are manufactured by using quality assured material and advanced techniques, which make them up to the standard in this highly challenging field. The materials utilized to manufacture Havells 1 Sq mm Single Core Life Line Plus S3 Yellow HRFR PVC Flexible Cables WHFFDNYA11X0 Length 90 m, are sourced from the most reliable and official Low Tension Cables vendors, chosen after performing detailed market surveys. Thus, Havells products are widely acknowledged in the market for their high quality. We are dedicatedly involved in providing an excellent quality array of Havells Low Tension Cables.